Although match racing seems about tactics and smart use of rules, all these become only meaningful at the hands of a good crew. How do you want to set up a situation to give your opponent a penalty if you can't handle the boat? Or how do you want to escape a tight cover, if your tacks take ages to complete? So far, I was lucky to sail with good sailors. But, bringing together good sailors does not neccessarily result in a good team. Besides being good at what they do, team members must also be able to keep their cool at tight situations, trust the ability and judgement of each other, maximize concentration, minimize shouting and unnecessary talking...the list is long. They also have to get along well. You don't want your few days of escape from work to turn into a stresfull trip. To sum up, if you want to enjoy match racing find a good bunch of people with both social and technical ability. This might sound hard but don't get scared, building up the team spirit can be as much fun as sailing! Currently, I'm also learning with my sailing buddies and brothers how to become a better team. The good thing is when you are close to the bottom of the learning curve, the only way is up! It's now official! Winning the selection event, we received the permission to represent Turkey at the Nations Cup! It was a great event. As it is usually the case, the best two teams made it through the round robin and semi finals to fight head to head at the final. It was us against Kemal Muslubas, the olympian at Athens '04 in Laser class. His team was made of some of the best Turkish sailors: Ertac Sunman, Fatih Ozmen, and Kerem Ozkan, while I had team alaturca on my side; Arda, Kaya, and Oguz. Unfortunately Kaya got sick after the round robin and we had to replace him with an upcoming young talent, Mert. The first race, we won the pre-start and even managed to give them a penalty. But it seemed like it was still not enough to hold them behind. On the second beat they started a tacking duel and got closer and closer with every tack, when we decided to get seperated. We managed to round the mark in front but they were just on our tail on the last downwind. Using the gusts from behind they finally managed to get by us on the last 100meters of the leg but still had to complete their penalty. So, it was us who were first on the line. 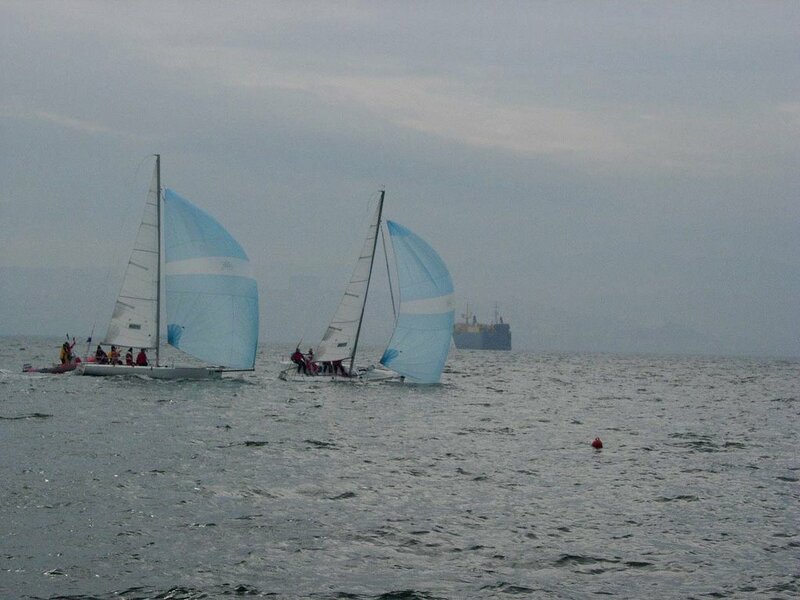 The pre-start was ours again on the second race; we were ahead at the gun and they had a penalty. This is where we got over-confident: we didn't cover. They went left, found a nice gust and passed like 4 boat lengths ahead of us at the next crossing. The distance remained almost unchanged until the last downwind leg where they decided to take their turn right after the windward mark. We got close a little, and then the wind start to die off. We saw a gust on the left side of the course and gybed immediately towards it. Eventhough the gust never really came we still found more pressure then they had and got a little ahead but a little too much on windward. Then the wind died off completely and we started to drift towards the finish. We both gybed and now we were leeward of them and behind, while they had the finish 50 meters in front of them...Then a miracle happened. A gust came from out of nowhere, slightly from behind them and directly hitting us: We got pushed full speed towards the line and hit it close to the leeward end, just a boats length ahead of them! When did you start sailing? I don't remember...I helmed at 6. Which boat did you sail? Surprise, which is a good boat to learn sailing, despite the fact that it is a keelboat. Occasionally I also sailed 470, Mumm 30, Laser, and now Decision 35. When did you start match racing? 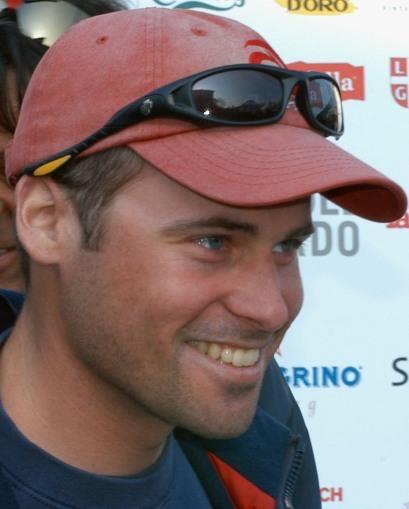 In 2001 with Alinghi Swiss Tour and 2003 with International grade 3 Match races. Your best result so far (in match racing)? Beating Jochen Schumann and Philippe Presti at the Geneva Match Race 2003, Winning the JP Morgan Winter challenge a year ago. Any special training for special events? Training is always a problem, as you need your team, a good infrastructure and a good opponent at the same time and venue. I do some training at the CER in Geneva and we try to practice on Streamline Boats for the St. Moritz Match Race. Your best move so far in a match? Being in front leading by a few meters but with an outstanding penalty, we moved the game close to the committee boat. Followed a hard fight and we tried to do our penaly while he passed between us and the committee. The match was normally lost for us but then he hooked with his shrouds the "bowsprit" of the commity vessel. He was stopped abruptly 1 metre from the finishing line and we could win the race. Your worst move so far in a match? There are definitely too many of them. Maybe being inside at the zone of Ed Baird at the leeward mark, passing the mark as inside boat and nevertheless getting a penalty was not my best move. How much money do you spend in a year on the circuit? I never calculated that in detail, it must be a couple of kSFr for the whole team. As we actually only have sponsors for some specific events the whole team need to make personal contributions. What do you thing the "best of best" do better? I think it's a matter of precision and teamwork. What wind conditions do you like? I like when it's a little shifty, this opens the game. Do you do any mental training? No, but we should...? What's your goal for the upcoming season? Short/middle term: win a grade 2 event. Long term: steadily increase our level. What do you think is the most important component in match racing? 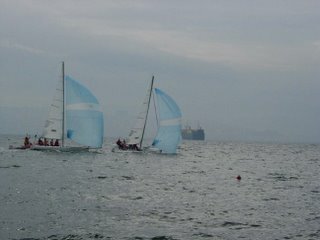 I think it's team work, compared to fleet race you rapidely see the qualitiy of a team in match racing. Any tips for newcomers in match racing? Don't forget to sail fast.